By R.E. City, London. No size label but appears to be approximately 71/4. 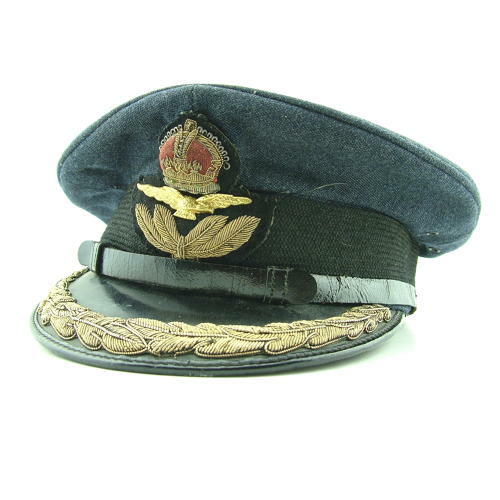 Differs from the standard officer rank peaked cap in having a patent leather/shiny peak with a single row of gold bullion embroidered leaves. The cap retains good colour and the barathea is generally in very good condition bar a smallish darned repair on the crown and a few smaller darned repairs around the sides. None of these are too obtrusive (see photos). The badge and mohair band are very good as is the peak and leather underpeak. The leather band is complete but has surface cracking and wear. Dark blue-grey satin lining with greasecloth (worn) still in place. The inner leather band shows wear but is also good. A nice example of an increasingly scarce cap in a good size. Stock code U16637.